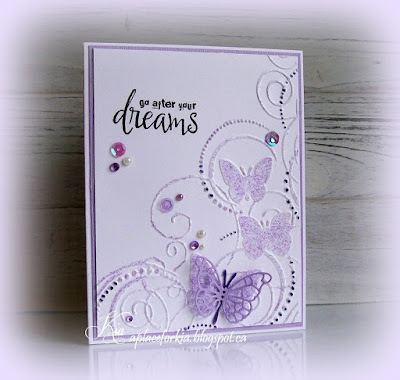 I did this card today for the Clean and Simple challenge over at Splitcoaststampers which is "A Purple Celebration". I read a tutorial on Glitter Embossing and I wanted to try it, but being difficult, I wanted to use this embossing folder. In the tutorial you emboss the embossing folder and the background is what is decorated - but I wanted it the other way around. I used my brayer to apply my embossing ink to the raised portion and for those difficult areas I used my Emboss It pen. I mixed purple glitter with clear embossing powder and applied. For interest I added some glitter marker to some of the dots and to the butterfly, and of course sequins, crystals and pearls to finish. Thanks for having a look. Products: Darice Butterfly Embossing Folder, MB Pippi Butterfly, Stamplorations Noteworthy, Martha Stewart Glitter, Clear Embossing Powder, Brayer, Emboss It, Sequins, Pearls, Crystals. 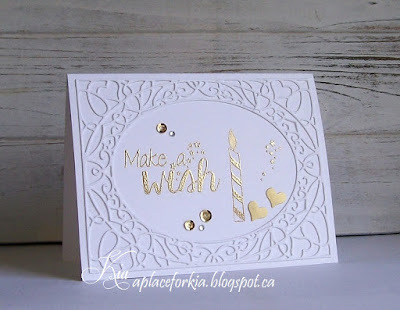 I did this card for the Inspiration Challenge at Splitcoaststampers today. We had a visit to a site called the China Online Museum, where I found this scroll for my inspiration. 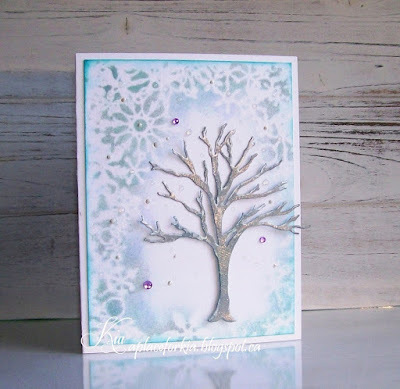 I shadowed my tree with markers and die cut my blossoms from glitter paper. As I did not have pink glitter paper I coloured a couple of the blossoms with pink glitter markers, and scattered sequins, gems and pearls to finish. Products: Pink Petticoat Trendy Trees, Digital Happiness Symbol, Memory Box Fancy Blossoms, Spectrum Noir Markers, Martha Stewart Glitter Markers, Sequins, Crystals, Pearls. then stamped with the birthday sentiment. 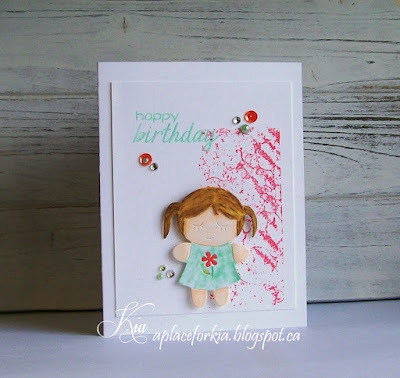 I am entering this card in Simon Says Stamp Anything Goes, Happy Little Stampers Stencil and Addicted to CAS Code Word Red challenges. Products: Memory Box Textured Mesh Stencil, Stampendous Pen Pattern Butterflies and Butterflies Die Cut Set, Frantic Stamper Celebrations Sentiment. 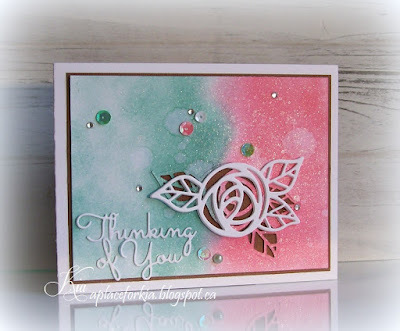 I did this card for the colour challenge on Tuesday at Splitcoaststampers which was to use a mint, strawberry and espresso. I sponged the colours using Tim Holtz Distress Inks Worn Lipstick and Evergreen Bough, then sprinkled with water and spritzed with white ink. I die cut my scribble rose on the wrong side which is what I wanted, but it took me 3 tries! It is ingrained in me to cut the right way. In any event I finally managed it. I used the brown to frame and it peeks through my cut rose. I then spritzed with Glimmer Mist and added the Scribble Rose which is doubled and the sentiment along with sequins, pearls and crystals. This was a fun card to make and a bit of a change. Products: Frantic Stamper Scribble Rose, Impression Obsession Greetings, Sequins, Bo-Bunny Pearls, Crystals. This is my card for the Clean and Simple Challenge at Splitcoaststampers today called Sweet Treats. My candy is a digital image from K. Pertiet. I used plaid paper for my background and die cut the candies using the heart and scalloped heart die to look like a box of candy and attached on foam dots inside the negative from a larger heart die, which is also on foam strips. I added the Love sentiment which is shadowed in black and a few sequins to finish. Thanks for having a look today. 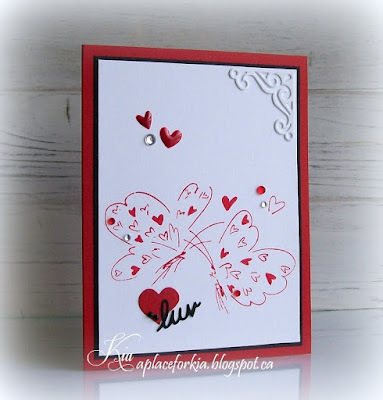 Products: Spellbinders Classic Hearts and Scalloped Classic Hearts Dies, Dee's Distinctively Love from With Love Die. 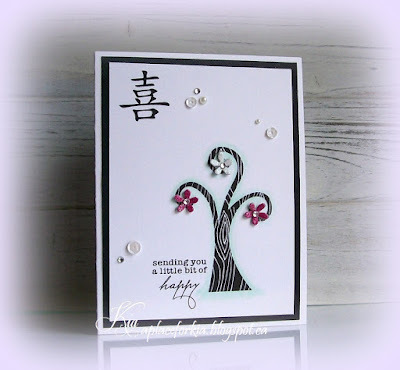 I had a lot of fun doing this card today, which I did for the Inspiration Challenge at Splitcoaststampers. We were sent to a wonderful site called Uncommon Goods where I found a lot to give me inspiration. I came across this Cribbage Board and was reminded that my Dad played cribbage when I was a kid. I thought it was the perfect inspiration for my card, as I wanted a thank you card for a male friend. Earlier in the week my stamping friend Karen Dunbrook did a written tutorial for her Woodgrain Finish, which I also wanted to try. The look is a great background as you can see. Thanks for having a look. Products: Frantic Stamper Fern, Frantic Stamper Accessory Words #3, Scorpal, Tim Holtz Distress Inks Tea Dye, Rusty Hinge, Shabby Shutters. I did this card for the colour challenge at Splitcoaststampers today which was to use a lighter pink, darker pink and orange. I love these colours together, and I knew my little Caterpillar would too! I coloured using Spectrum Noir markers and Martha Stewart Glitter markers, and added googly eyes for fun. I made this for my friend to give her granddaughter, and I know she is going to love it. 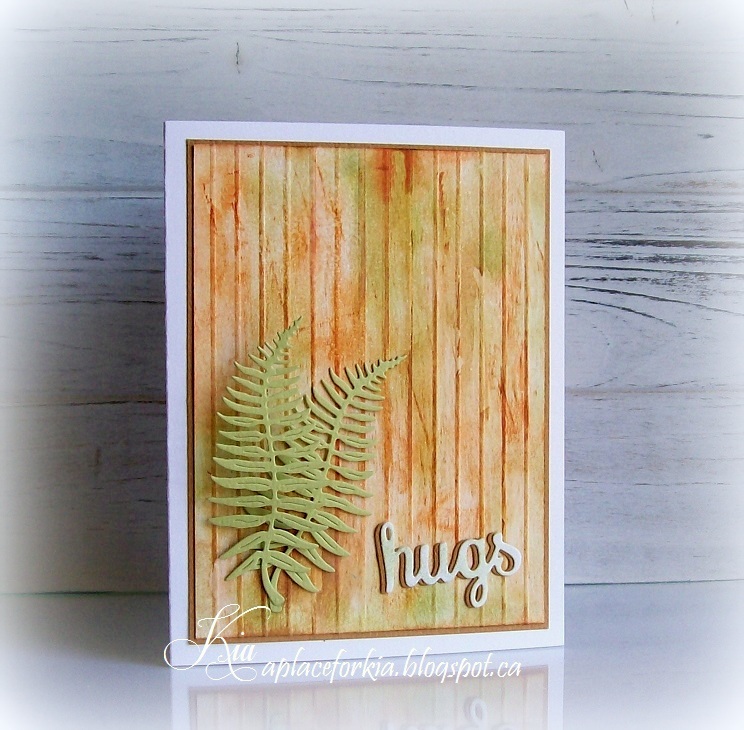 I embossed the background with the leaves folder and die cut the grasses which I coloured and styled. I styled the Caterpillar and attached her using foam dots. I die cut the butterflies using Bazzill papers and styled before attaching. This was such a fun card to make and I hope you like it. 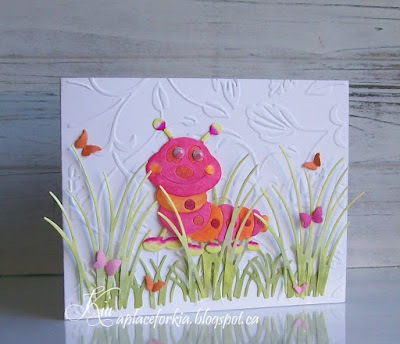 Products: Frantic Stamper Cute Caterpillar; Impression Obsession Grass and Grass Border, Memory Box Butterfly Delights, Esctasy Crafts Leaves Embossing Folder. 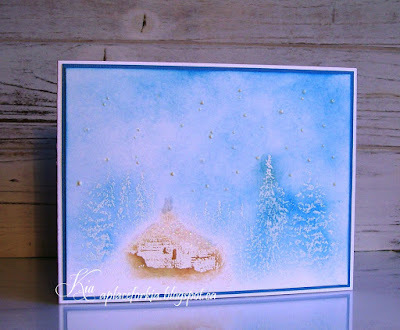 The CAS challenge at Splitcoaststampers is to make a card that reminds us of snow and ice, which I think I have accomplished with this card. I stencilled my background using Tim Holtz Inks in Evergreen Bough, Peacock Feathers, Shaded Lilac and Hickory Smoke giving the background a bit of movement and a ice look. I die cut the Impression Obsession Bare Tree and shaded the trunk using the Peacock Feathers and added galaxy marker and white gel pen to the branches, then covered the tree with Fresco Finish Metallic Glaze to give it that "cold" feel and attached on foam strips. I finished with some Liquid Pearls, Glass Effect Gel and a few Crystals. Products: Memory Box Winter Flurry Frame Stencil, Impression Obsession Bare Tree, Bo-Bunny Crystals, Liquid Pearls, Glass Effect Gel, Fresco Finish Metallic Glaze. Another card I made for the January release from Frantic Stamper again using stamps from the Celebration stamp set and the number "1" from the Trio Number Dies. Each set is a trio of different sizes of a number, and in my case I used the largest of the number "1" die. Using Tim Holtz Salty Ocean for my colour I stamped the background musical stamp to frame my sentiment "Celebrating You". I die cut the smallest oval from the Elementals #12 for the "my" sentiment which I attached on a foam dot, and I made the pound sign using the smallest number "1" die from the Trio of Ones die. 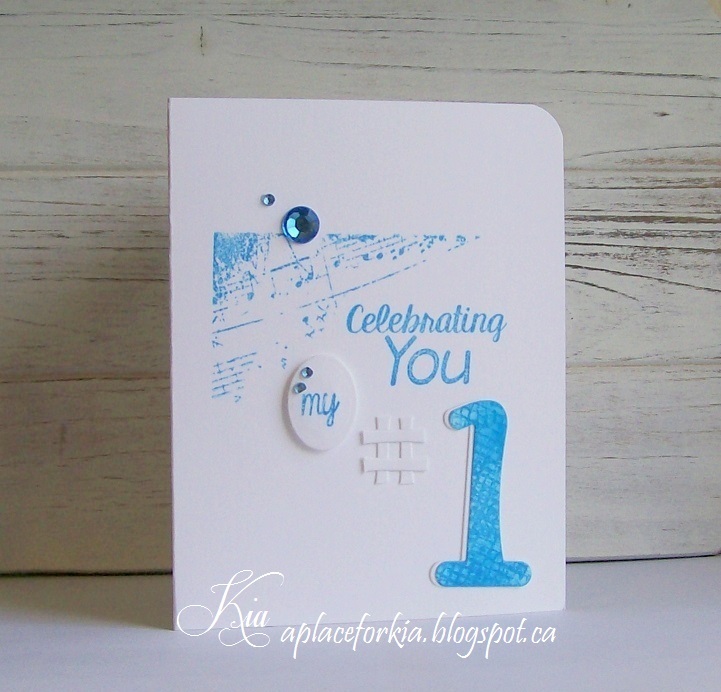 I used the largest "1" from the set which I stamped an impression on and coloured with the salty ocean. I then shadowed the blue "1" with a white number for depth and finished with some Bo-Bunny Crystals in the same beautiful blue. 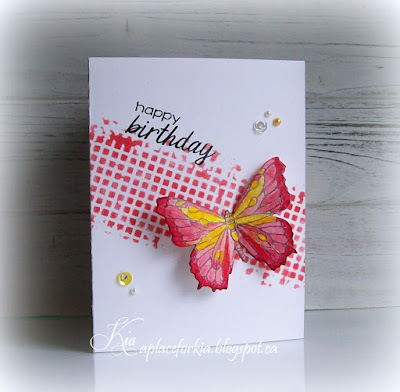 This is another card I made with the new Frantic Stamper January release dies and stamps. I wanted it to be a simple yet elegant birthday greeting and I think embossing in gold and framing with a beautiful die speaks to the "elegance" I wanted, and the white on white keeps the card clean and simple. 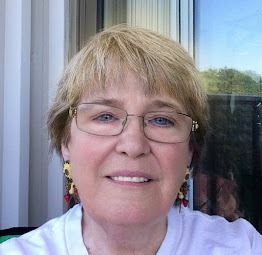 I used the new Frantic Stamper stamp set called Celebration to stamp my images and heat embossed the images with gold embossing powder to get my look. For my framing I used the new Elementals Ovals #12 which includes a set of 7 nested dies. I added 2 of the heart negatives from the frame which I coloured using my Gold Leafing pen and added my signature sequins to finish. Thanks for having a look. Look at this smile ... I love this little Caterpillar from the Frantic Stamper January release, he gives me a giggle. For my backdrop for this fellow I sponged some Tim Holtz inks for my clouds and die cut a grass border which I used as a template to colour in my grass where I used a few colours of green. Then I did my Caterpillar and styled him attaching on foam dots to give him some movement. I added the google eyes and inside the holes I added the negative cuts and coloured them using glitter markers. 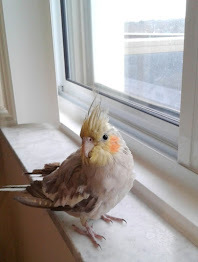 It is hard to see in the picture because they are smaller, but it is really cute IRL. I added the hugs sentiment and of course sequins to finish. Thanks for looking. I was playing around with some Viva Decor Inka Gold Lavared ink which I had mixed with water and wondered what using just red in the smooshing technique would look like, so I tried it and the background is the result. I really like it as it turns out, it looks like there are other colours mixed in but it is just the Lavared. I used the same Penny Black stamp only this time I used black embossing powder for the butterfly. I also used the Frantic Stamper valentine confetti die again for the sentiment and a scatter of sequins and crystals. Thanks for looking. Products: Penny Black Valentine Dance, Frantic Stamper Valentine Confetti, Black Embossing Powder, Sequins, Crystals. 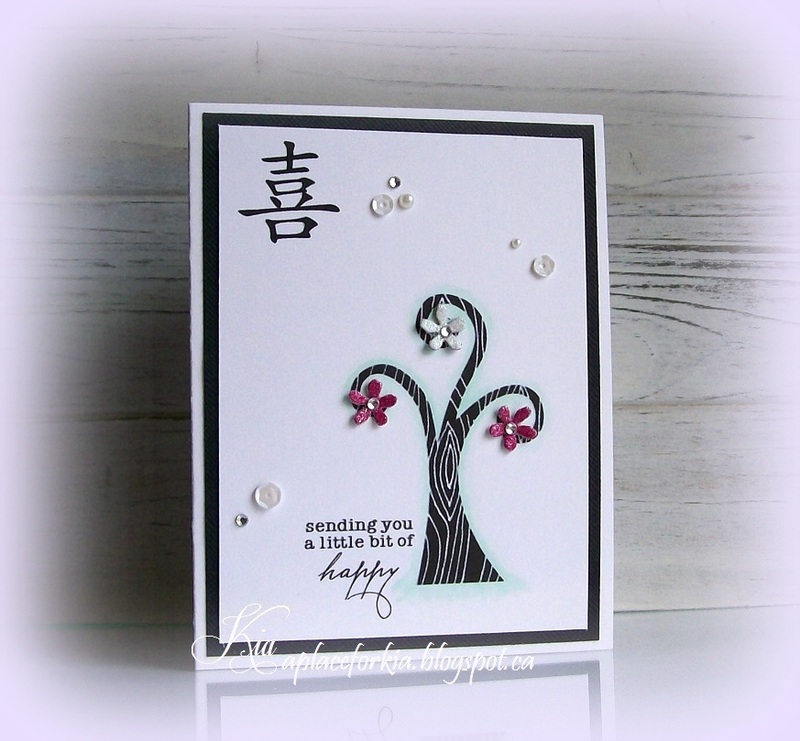 I made this for the Colour Challenge at Splitcoaststampers today, which is to use black, white and red. It is hard to see in the picture, but the butterflies are stamped in red and heat embossed using clear embossing powder. I added Frantic Stampers "heart" and "luv" sentiment from their Valentine Confetti die, the corner die and some heart sprinkles along with crystals and pearls. Thanks for having a look today. 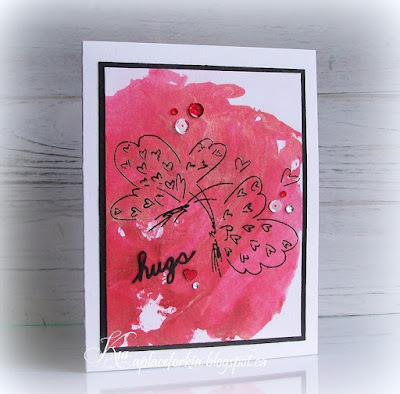 Products: Penny Black Valentine Dance, Frantic Stamper Valentine Confetti, Cuttlebug Corner, Doodlebug Sprinkles, Crystals, Pearls. 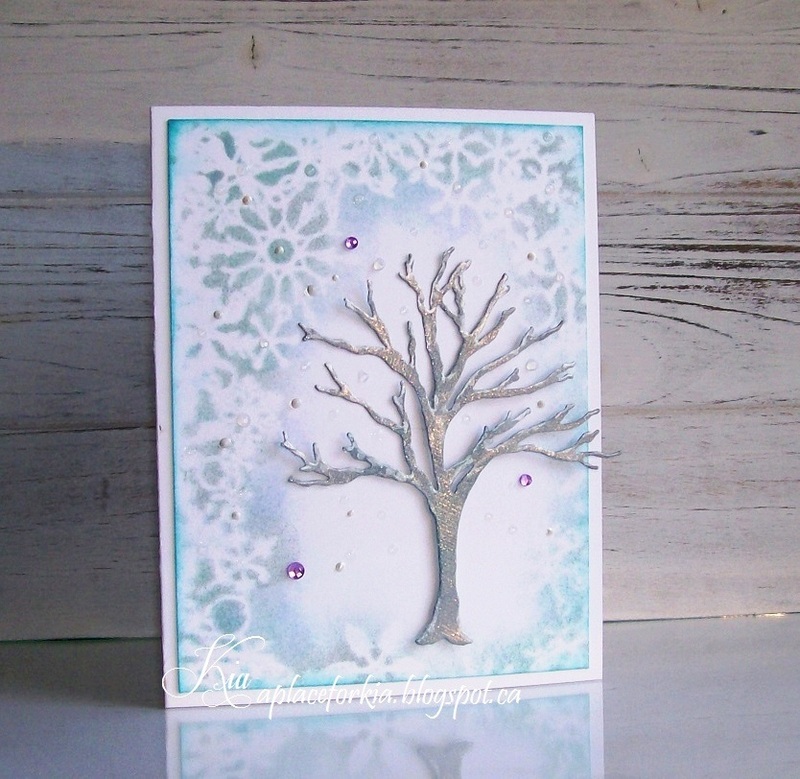 Back to the challenge which was to make a WOW card, white on white with colour only used for the sentiment. For fun I used the Frantic Stamper Valentine Confetti XOXO for my sentiment. The hearts are embossed with different folders and both are on foam dots and the background is also embossed. Products: Frantic Stamper Valentine Confetti; Impression Obsession Heart Set; Crafts Too Love Hearts, Cuttlebug Script and Darice Crackle Embossing Folders; Sequins, Martha Stewart Glitter Markers. 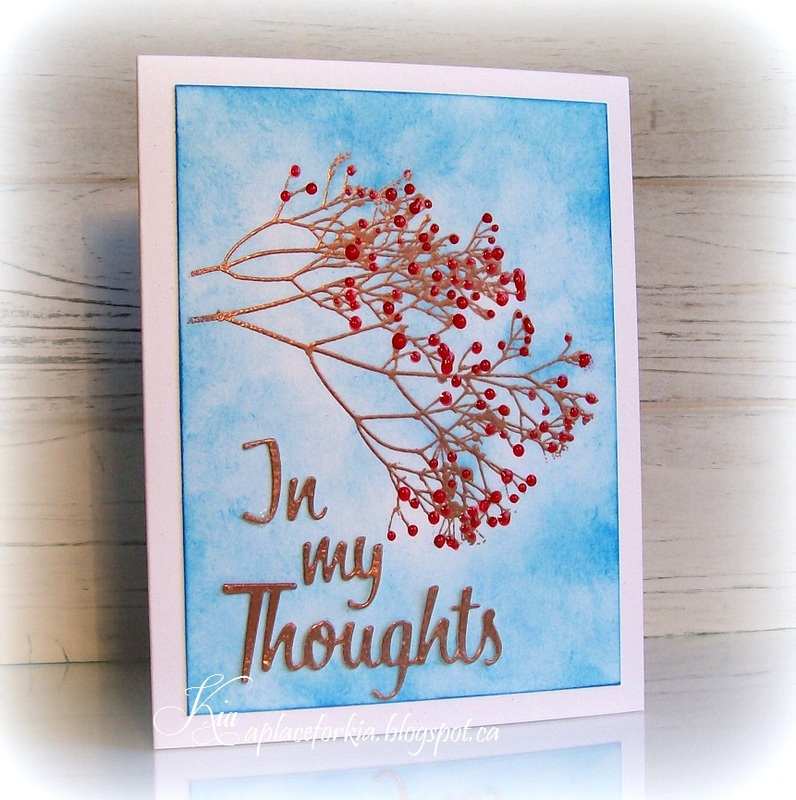 Products: Penny Black Berry Tree, Viva Perlen-Pen, Dee's Distinctively Sentiment, TH Distress Inks Salty Ocean and Copper Embossing Powder. I need to do some thinking of you cards so for inspiration I had a visit to Splitcoaststampers Inspiration Challenge where we visited a Pinterest Board about Winter. I picked this scene for my inspiration. When I first did this I had the roof in all white glitter. When viewing the picture it was clear the roof looked goofy, so I added the ink over the glitter with a stiff paint brush, and now it is defined and I like it much better. I hope you do as well....thanks for looking. 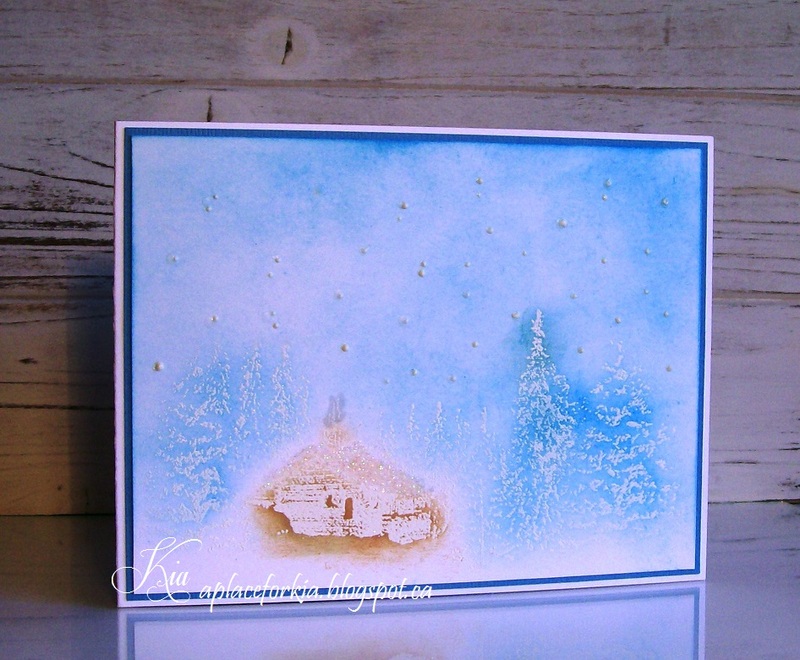 Products: Impression Obsession Winter Cabin Stamp by Gail Green, White Embossing Powder, Liquid Applique, Tim Holtz Distress Inks Tumbled Glass, Salty Ocean and Tea Dye, Glitter. 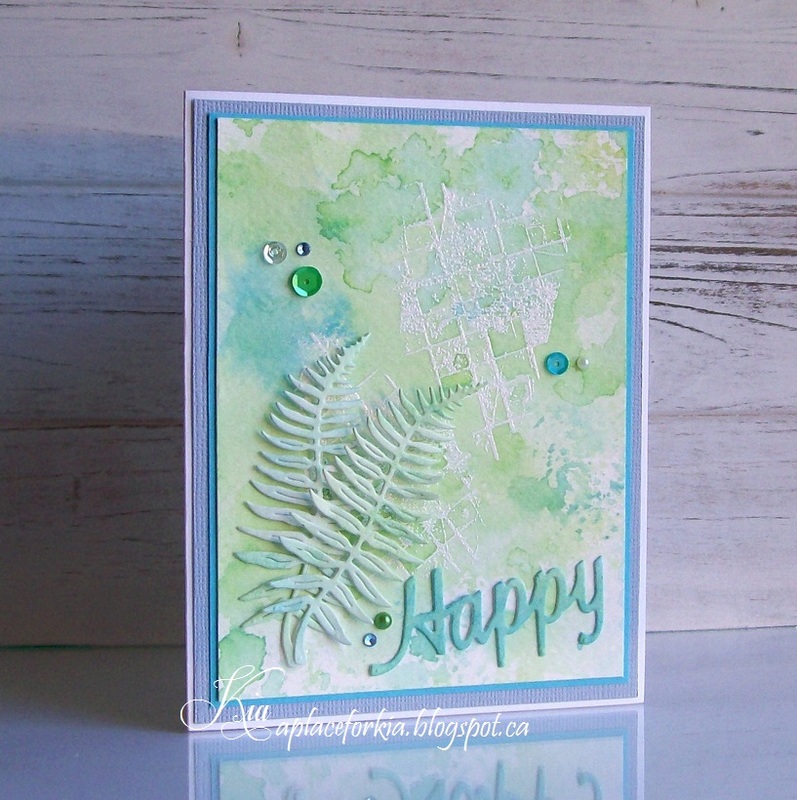 I did this using the colours from the colour challenge today at Splitcoaststampers. For my background I first embossed my stamped impression with white embossing powder, then did the smooshing technique using green and blue. I die cut my ferns and sentiment from leftovers, and added more blue to the Happy sentiment. A few sequins, pearls and crystals to finish. 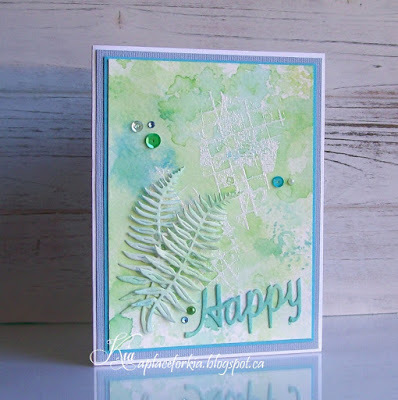 Products: Frantic Stamper Fern and the Happy is cut from the Frantic Stamper die called Happy Happy Happy; Stamplorations Mini Mixed Media Backgrounds, White Embossing Powder. 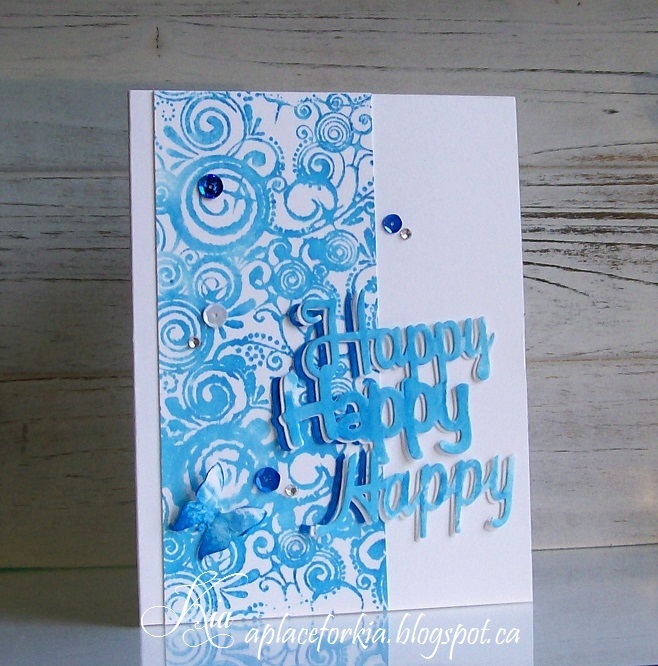 My card for the Clean and Simple Challenge at Splitcoaststampers today which is to use the word Happy on our cards. This die immediately came to mind and I do like the way it turned out. I inked the background stamp with TH Distress Ink Salty Ocean and spritzed with water, and as it is a large stamp I laid the paper on the stamp instead of the other way around, and rubbed with my fingers to ensure contact. I layered the Happy die 2.25 times - lol! The top layer I painted, then I cut the white layer to shadow the blue, and finally on the bottom I die cut the H's and heavily sponged on the Salty Ocean for a little pop. I painted the butterfly which is a Martha Stewart punch. And, my signature sequins and crystals to finish. I hope you like it ... thanks for having a look. Products: Frantic Stamper Happy Happy Happy sentiment die, Impression Obsession Swirls and Stars Background Stamp, Martha Stewart Butterfly Punch, Sequins, Crystals. 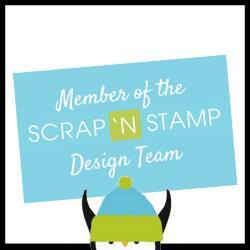 The Inspiration Challenge at Splitcoaststampers today is a visit to an Etsy store called The Wildlands. A beautiful store. I did some stencilling and stamping for my card. 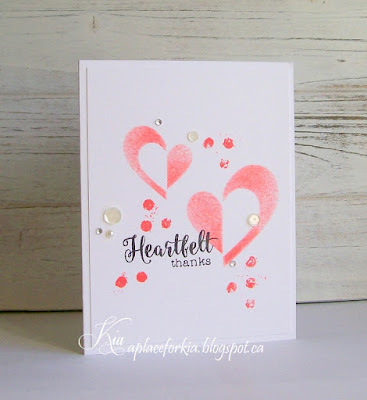 The heart stencil is called Building Hearts by Simon Says Stamp and the sentiment stamp and dots stamp are from Stamplorations, the sentiment is Fond Expressions 2 , the dots are Mini Mixed Media Backgrounds. Thanks for having a look. Products: Simon Says Stamp Building Hearts Stencil, Stamplorations Fond Expressions#2 and Mini Mixed Backgrounds, Sequins, Crystals, Pearls.